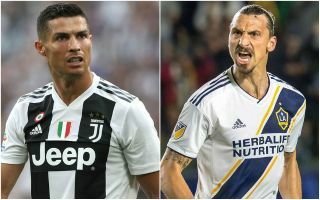 One former Manchester United star has hit out at another as Zlatan Ibrahimovic took aim at Juventus forward Cristiano Ronaldo over his transfer from Real Madrid to Serie A in the summer. The outspoken Swede has pulled no punches with his analysis of recent Ronaldo comments that he likes a ‘challenge’ after ending a long stay at Real Madrid to join Juve. Ibrahimovic is clearly not impressed as he does not see joining a team that’s been so completely dominant in Italy for the best part of a decade now as a challenge at all, describing the Portugal international’s comments as ‘bulls***’. “Cristiano is talking about new challenges, he calls it a challenge to move to a club where it is already normal to win the Serie A. Why did he not choose a club from a second division a few years ago?” Ibrahimovic told Voetbal Nieuws. “To try to be with such a second division champion and to lead them to the highest level. That is a challenge. Both these players are known for being two of the biggest egos in the game, so if there is a war of words to be exchanged between them it’s going to make for great entertainment – we can only hope that, somehow, Jose Mourinho gets involved too. To be fair on Ronaldo, though, after winning three Champions League finals in a row, playing for Juventus in European competition probably does feel like a bit more of a challenge – and it’s that trophy he’ll have been brought to the club to win.